The need for a truly modern framework for engineering education has never been greater. The Quanser Method™ was developed to answer that need and make teaching and research of modern control systems and mechatronic concepts more effective, relevant and efficient. 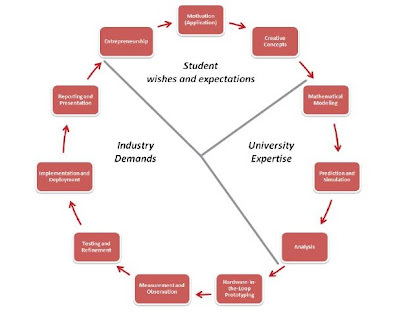 Of particular relevance for the 21st century, the Quanser Method gives institutions that follow the conventional lecture + lab + project teaching structure a new, more engaging way of teaching engineering concepts – a way that closes the gap between theory and practice, energizes a new and technically sophisticated generation of engineering students and aligns with current industry R & D practices. The Quanser Method reflects the key engineering workflow found in industry, and thus provides a modern, rigorous framework for teaching and learning in academia. With the Quanser Method, algorithms on the page are a beginning not an end - a launch point for students to bring their control design theories to life through the use of a modern, interactive curriculum and real-time hardware-in-the-loop testbeds. Structured as a circle, the Quanser Method reflects the key engineering workflow found in industry, and thus provides a logical and rigorous framework for teaching and learning in academia. The workflow involves numerous steps, from mathematical modeling to control design, hardware-in-the-loop simulation and more, with all the steps resulting in a system that’s efficient, effective and ready to deploy. To learn more, download the whitepaper “The Quanser Method”, written by Dr. Tom Lee, Ph.D., Chief Education Officer, Quanser.